Your pecs aren't just your pecs. Okay, so they are your pecs, but it's a bit more complex than that. Let's break this down. Your chest muscles start just below your collarbone with the thin clavicular heads of the pectoralis major, which extend to your your shoulders. But when someone says "pecs," they're most likely talking about the sternal head of the pectoralis major, the large, fan-like muscles that make up most of our chest and extend down to the upper abs. If the sternal heads are your "lower pecs," let's not forget your "outer pecs," the pectoralis minor. Despite all these parts of the pecs, remember that isolation exercise is a myth — when you work the pecs, you work all of the pecs. However, you can emphasize the lower muscles with a few workouts that come recommended by the pros. The bench press is among the most essential chest-sculpting exercises, and this classic variation puts extra focus right where you want it: On the sternocostal region of the pecs. For lower pecs activation, this inclined press variation cleanly outclasses both a flat bench and a declined angle. How To: Lie with your back flat on a bench declined at a 45-degree angle, grasping a racked barbell with your hands just over shoulder-width apart. Keep your legs apart and feet flat on the ground (or on a raised pad) as you lower the bar until it almost touches your chest. Lift the bar upward by straightening your arms, keeping your wrists straight and back flat on the bench, then return to the starting position. Read more: Are Decline Bench Presses Necessary? Imagine the relationship between your arms and chest when you lift weight on a declined bench. Because your chest is a lowered position, the lower chest muscles contract more than usual as you press weight upward. 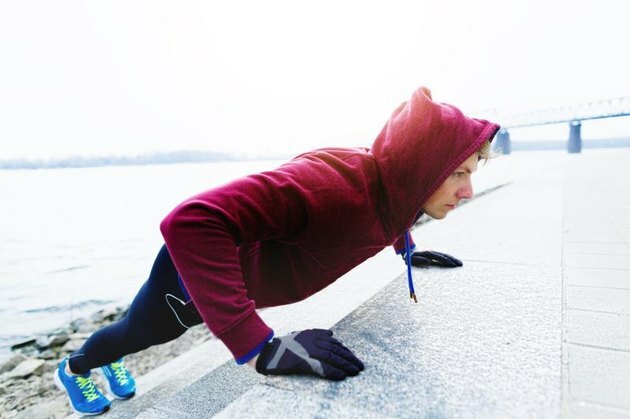 An incline push-up — which comes recommended as a lower-chest booster by Certified Strength and Conditioning Specialist Jeff Cavaliere — puts your chest and arms in a position very similar to a decline press, without the need for any fancy equipment. How To: Place your hands, positioned a bit wider than shoulder-width, on the edge of a bench, bar or raised platform — even a sturdy chair or step will do. Your wrists and elbows should be aligned as your back and legs are extended straight and supported on your forefoot, with your feet together. Straighten your arms to raise your weight, then bend your arms once again as you lower your chest to complete a rep.
To top off your lower chest routine, bodybuilder Lance King recommends chest dips, which help trim up the area. For this one, you'll need a wide dip bar. How To: Mount the bar with your arms at your sides and palms facing inward. For the starting position, your arms should be completely straight, your knees bent slightly with the feet elevated, and your upper body leaning slightly forward at the hips. Bend your arms at the elbows to lower your body, keeping your elbows pointed outward to focus muscle activation on the chest rather than the triceps. When you feel that satisfying stretch in your lower pecs — typically when your elbow is just about level with or higher than your head — raise yourself back to the starting position with a smooth motion. 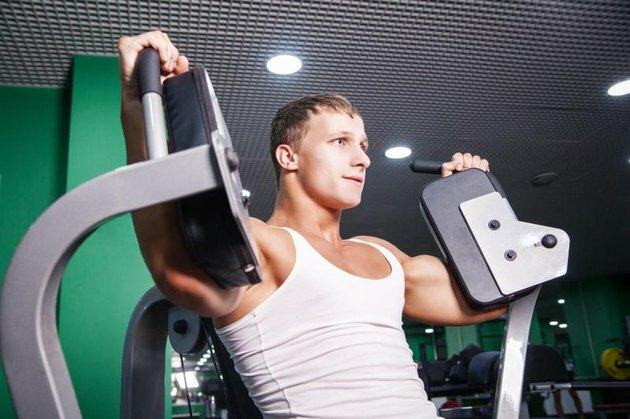 Read more: Is a Dip or Bench Press Better? What Do Decline and Incline Push-Ups Work On?